Graphic design is a ubiquitous presence in our world today. You will hardly find an industry that doesn't need a graphic designer in one form or another. In the old days, graphic designers had to create their designs from scratch, but in today's digital world, there are hundreds of software that can be used to create designs quickly and beautifully. 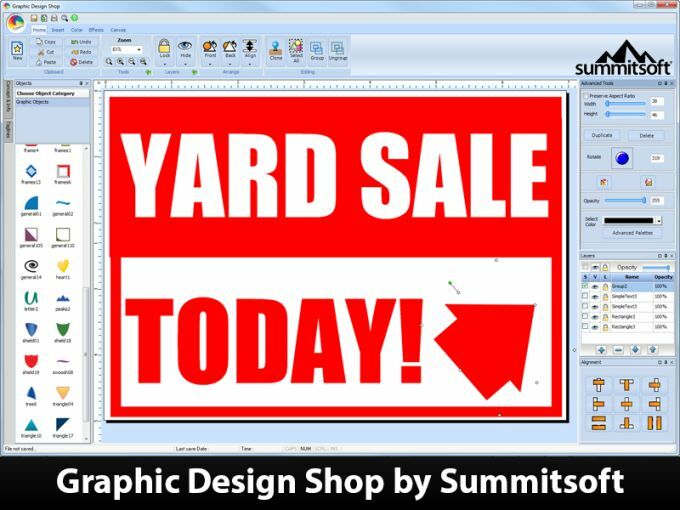 Graphic Design Shop by Summitsoft Corporation is one of those software that are geared for art and designing. It may not be as great as the powerhouses of design such as Photoshop or Illustrator, but it is a great alternative. Installing the software is not easy or quick. There may not be a lot of options involved in installing the software, but waiting for it to finish downloading is what takes a bit of time. It's not a long wait, but it would have been better if it was a little bit faster. What makes it worse is that after installing the software, there is an additional load screen where you have to wait for the program to load again. In addition, there are ads that you have close to get to the program itself. This may not be a big deal to some people but it does take away from the user experience, especially if you're more into swift and quick progress. Undoubtedly, the Graphic Design Shop doesn't hold a candle to Photoshop in terms of editing power. However, that doesn't mean it doesn't have any tricks above its sleeve. It does possess some great features that any graphic designer will need. For example, you can add text and clip art to your designs. This may seem ordinary but Graphic Design Shop provides users with some great freedom and flexibility when it comes to editing text and images. You can distort the text to make it look like a different font altogether. This program also supports layers which is always a good thing when dealing with anything drawing or designing related. There are also a multitude of effects you can use to make your design pop even more. For example, you can make your text pop by adding shadows and emboss onto them. All of these nice features are laid out in an easy to understand interface. Looking at it, the program is kind of a cross between Microsoft Word and Photoshop. There are the tabs and bars of the MS Word in addition to the panels of Photoshop. These two programs may seem like a weird pair to cross, but it works somehow. All of the essential functions are organized in an easy to understand way that will surely increase a designer's productivity. If Photoshop is way too pricey for you, or you don't need all of its extreme editing power then the Graphic Design Shop is a functional alternative. It's great for flyers, brochures, t-shirts, and more. With it on your computer, you'll be creating wonderful works of art quickly. Turn yourself into an artist and create stunning graphic designs and art for your business or just for fun. Whether you're creating web buttons, icons, logos, website graphics, cartoons, t-shirt designs, posters or anything else, Graphic Design Shop has the tools and support to help you create almost anything else you can dream up. What do you think about Graphic Design Shop? Do you recommend it? Why?